24/7 Loan Approval ~ No matter what time of day or night, you can apply for a White River Credit Union Loan and get approval 24/7! What a great way to take advantage of our great low competitive loan rates! Visit www.FundsForAnything.com to apply. Mobile Check Deposit ~ For those times you don’t want to take off your bunny slippers to deposit that birthday check from Aunt Gladys. 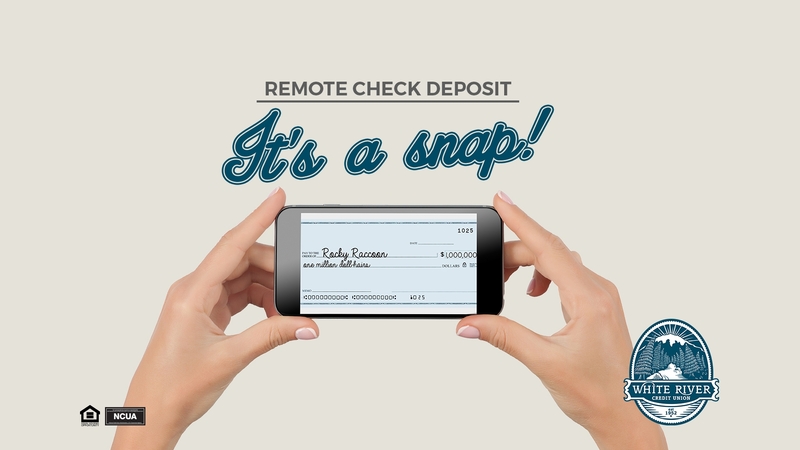 Just log in to your account using our White River Credit Union Mobile App (located in your App Store), then select Mobile Deposit to snip a picture of your check and voila! Mobile Wallet ~ Add your White River CU Debit Card(s) &/or Credit Card(s) to your ApplePay, GooglePay or SamsungPay Mobile Wallet. It’s the most secure way to pay, and all you need is your mobile phone. Your actual card number is never stored on your device, so there’s no way for the merchant or others to intercept your information. After Hours Debit/Credit Card Support ~ Out and about and can’t figure out why your card is not working? You can call 1-888-526-0404 24/7 to help you figure it out! Change your Debit/Credit Card PIN on the fly ~ Call 1-877-746-6746 24/7 to select your own PIN any time you feel like it. White River Credit Union Chatbot ~Open the White River Credit Union skill from Amazon Alexa, Facebook messenger, or Google Home. New! The White River CU virtual assistant is now available on SMS! You can connect with us through text. Just text (802) 552-8383 to chat with the White River virtual assistant to learn about our services, general financial knowledge, and more! MyCardRules ~ Take control of your WRCU Debit/Credit cards. You decide when, where & who uses your cards. Download the app from your App Store. MoneyDesktop & MoneyMobile ~ Track all of your accounts (WRCU and Non-WRCU) in one location. Set up a budget if you so desire and set goals. Login to HomeTeller & select MoneyDesktop from the menu to get started.